Robin Hood Gardens is a council housing complex in Poplar, London designed in the late 1960s by architects Alison and Peter Smithson and completed in 1972. 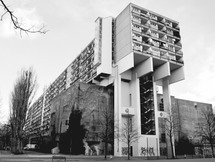 It was intended as an example of the 'streets in the sky' concept: social housing characterised by broad aerial walkways in long concrete blocks, much like the Park Hill estate in Sheffield; it was both informed by, and a reaction against, Le Corbusier's Unité d'Habitation. The estate covers about two hectares and consists of two long blocks, one of ten storeys, the other of seven, built from precast concrete slabs and containing 213 flats, surrounding a landscaped green area and a small hill made from construction spoil. The flats themselves are a mixture of single-storey apartments and two-storey maisonettes, with wide bwithin sight of the nearby Balfron Tower; both are highly visible examples of Brutalist architecture. 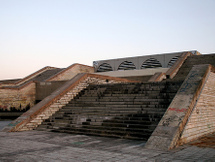 After a campaign to list the building as a historical landmark supported among others by Zaha Hadid and Richard Rogers failed, the structure was under the threat of being demolished. The demolition plans were finally approved by the Tower Hamlets Council at a meeting of its Strategic Development Committee on March 15th 2012. The decision to demolish the estate, on which there are 214 flats, was made as part of a larger £500-million proposal to regenerate the Blackwall Reach area. The regeneration proposal includes plans to build 1,575 homes, of which approximately 700 will be reserved for social housing and shared ownership. Interestingly the tenants have always supported the demolition. The chair of Robin Hood Gardens Tenants and Residents Association, has been quoted as being “very pleased” with the demolition decision.